Welds 24 gauge - 3/16 in. mild steel. Uses 120V power. $150 rebate available only through authorized Miller distributors. Redeem rebate. This technology provides a smooth, spatter-free start. The best starting machine in the 120V MIG category! No more pop-gun starts or spatter to clean up. Automatically detects when a MIG gun or spool gun is connected eliminating the need for a switch. Protect the finish of your Millermatic® 141, 190, 211 or Multimatic™ 215 with this woven nylon cover. 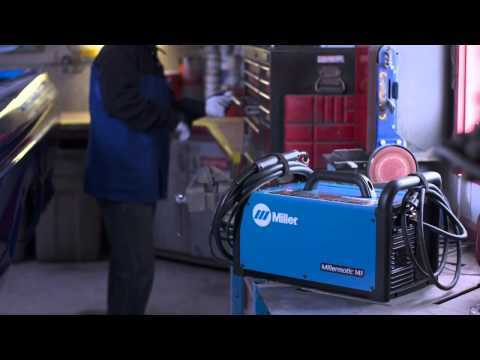 Check out these MIG welder maintenance tips to keep your machine in top shape. Watch this video to learn more about MIG welding and hear some tips and suggestions on purchasing your first MIG welder.